Mahmoud Tolba, the netizen who made the video reply to the Kuwaiti that criticized President Rodrigo Duterte is at it again! He is defending Filipinos and is demanding for the rights of every Filipino in Kuwait. Despite harsh conditions, the Filipino work overseas to feed their family, away from friends and loved ones, we still push through but recent events in Kuwaiti pushed our people and more over our government to the edge. 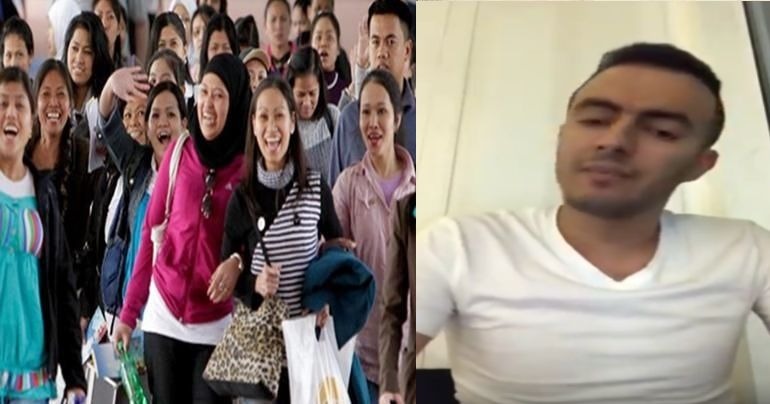 In his video, Tolba wanted to make things clear, he stated what the Filipinos are experiencing in Kuwaiti like having low quality social service and low salary then he followed it with the fact that Filipinos are very clean and hard-working people. He proceeded to complement the number of Overseas Filipino Workers in other countries like the United State. Stating that the Filipinos have very good jobs in the US, they are in various high ranking positions and federal organizations. Then he turned to the issue of physical and sexual assault on Filipinas by their own kafeels (employers) in the house that they work in Kuwait. And like a Violence Against Women protestor, he demanded that the Filipina should be able to dress whatever she wants to for she has the freedom to do so when she isn’t working for her kafeel and a Filipina must feel justice and no fear in her working environment. A day off was also another right that Tolba demanded, for every person needs to go out and breath. But the biggest and most important demand of all was the Law to protect the Filipinos from their own kafeel or sponsors. Why you ask? Tolba elaborated that 3% of Filipinas are sexually harassed yearly in Kuwait, that is first read, a small number. But if you put into perspective the total number of Filipinos in Kuwait, you’ll end up with an estimated 100,000 and 3% of that would be 3000 sexual harassment cases of employers and sponsors to Filipinas. Due to such numbers, he kindly asks the Filipinos to either go back home for it isn’t worth it, leaving your family, friends and country to face pain from your own employer isn’t worth 500 Kuwaiti Dinars. Filipinos should ask a raise, for all the Kuwaitis do is take and take and leave nothing for the Filipinos.